**2017 Update** Every year I get a few requests to sell this costume or make new ones, and I regret that I am unable to do so. I wish you all the best of luck in finding another costume or making one for yourself! Halloween is a busy time here at VisibleBlue. I get more traffic during October than any other month, no doubt thanks to the Cookie Monster costume series. But hey, that’s not really a surprise, considering I’m a terrible slacker during the rest of the year and I’ve updated….oh….only 4 or 5 times since then. Pathetic! 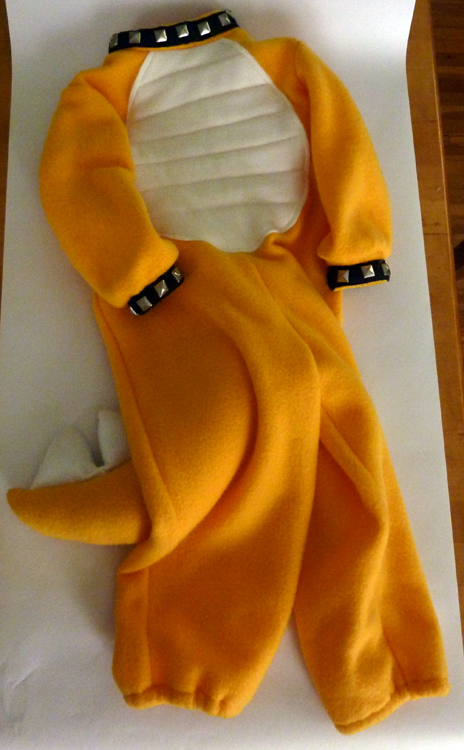 Now I’m just going to go ahead and drum up some more Halloween traffic with this latest series – homemade Bowser costume! This year, after some particularly inspired costume ideas (“tree,” “floor,” “mystery”) my son landed on Bowser – you know, the villain from the Super Mario Brothers franchise. Why pick a villain? Straight from his mouth: “I like monsters, and Bowser has spikes and I don’t have spikes.” Let’s remedy that, shall we? I thought this would be a fairly simple purchase. I see tons of Marios and Luigis every Halloween, so surely one of the most recognizable video game villains of all time would have his own costume! As it turns out, he does not. The only one I could find was a full-size adult mascot-style costume. Hey, at least I have some practice at this costume-making thing! I decided to break the costume down into parts, and I’ll do the same with these posts. The first post will focus on Bowser’s body, the second part of the series will be his shell, and in the third, we’ll construct his head. I’ll try to get the other two posts out before the week is over, but I’m actually still working on the head as we speak. So let’s take a look at the main body parts. Hey, look! He’s basically just a dinosaur. 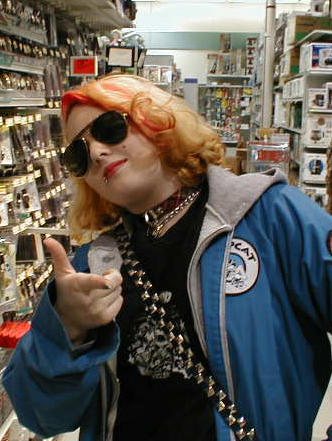 Now where have I seen this costume before…Oh yeah! My new favorite purchase, the Simplicity 2506 pattern! Last year I modified the devil pattern to make Cookie Monster, and this year I tweaked the dinosaur pattern a bit and came up with a pretty passable Bowser! I used gold and cream fleece for his skin, and felt for everything else. I followed the pattern mostly as directed (minus the head), with a few exceptions. For the whole project – not all of these will be used in part one. This list assumes you’re making the costume for a small child – for a larger kid or adult, you’ll need to increase the yardage accordingly! Like last year, I omitted the bottom of the booties so he can wear them like spats over his shoes. A strip of elastic holds them to his feet. 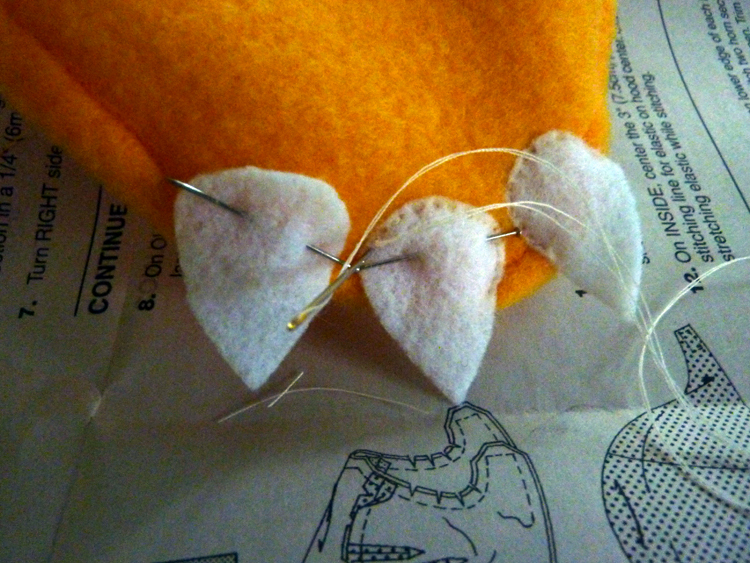 I cut six teardrops out of white felt and sewed them to the front of the booties for toenails. I added a few extra lines of quilting to the stomach, though in hindsight, I only needed to add one. I got a bit overzealous, I guess! Unfortunately, I didn’t take any photos of this process, but it wasn’t too difficult. Where the pattern directs you to cut the tail spike pieces, I chose to use white felt, and I only cut two pieces. I sewed and turned them like directed, but stuffed them firmly before sewing them into the tail. I prefer the 3-D spikes over the flat ones. Bear with me a bit, because here’s where the science goes out the window and the art comes into play. 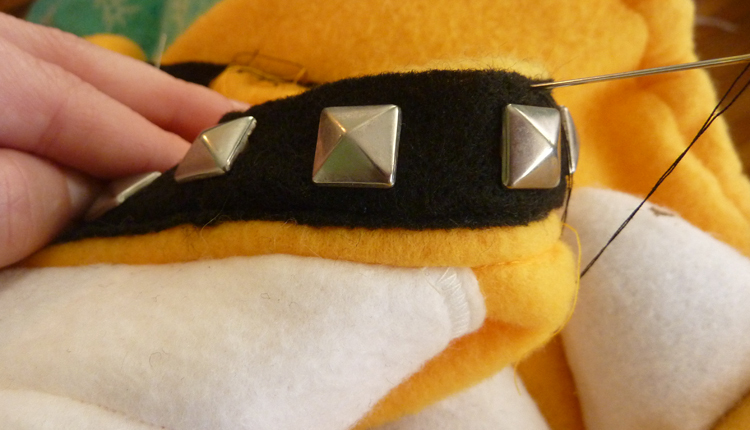 To make Bowser’s bracelets, necklace, and arm bands (which actually are not used in this section, but will come back in the shell tutorial), I cut strips of black felt approximately one inch wide. If you prefer, you could use something a bit stronger than felt for the upper arm straps, as they will be supporting the shell. If I had to do it over again, I might use ribbon or nylon webbing.) For the bracelets, I measured the distance around the wrist and was able to cut the felt an inch or so longer than that measurement. For the upper arm straps and neck, I had to sew two strips together to get the appropriate length. 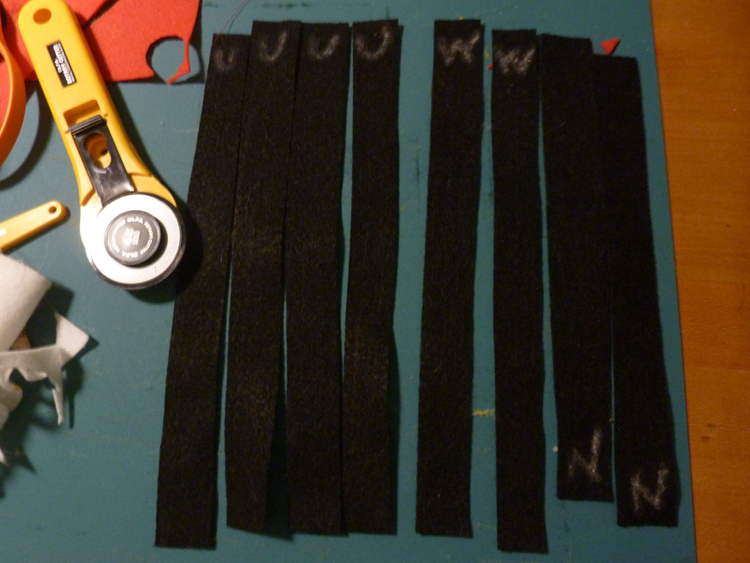 Here’s a photo of the strips after cutting – wrist pieces are labeled in chalk with “W”, upper arm pieces with “U”, and neck with “N”. I just guessed on the length of the upper arm pieces – you want to end up with something around the same length as backpack straps. For the spikes, I salvaged an old bag from another lifetime. They may not be as pokey as Bowser’s, but you get the idea. Plus, my son has to wear this to preschool. Did I think, 13 years later, I’d be using these on a Halloween costume for a kid? Not in a million years. After putting all the studs into the felt (they have little prongs on the back), I hand sewed the bracelets onto the costume wristbands, and the necklace onto the neckband, leaving about half an inch of overlap. I added a piece of hook and loop tape to each side of the necklace. It’d be cuter with a kid in it.